Looking for a Used Acadia in your area? CarGurus has 42,160 nationwide Acadia listings starting at $2,900. A long-overdue redesign brings a smaller, lighter Acadia, with a fresh 4-cylinder engine, more power for the V6, and a brand new “All-Terrain” package to compete with the new generation of midsize crossovers, but towing and interior capacity take some major hits. GM’s new C1 platform is the foundation for everything from the new Cadillac XT5 to the Chevy Traverse and Buick Enclave in its long-wheelbase form. After nearly 10 years of living on the Lambda, the Acadia is joining the prestigious C1 ranks for its 2017 redesign, and that means a shorter, narrower profile with a shorter wheelbase as well. More importantly, the Acadia shows up in 2017 with a brand new 4-cylinder engine, which contributes to an impressive 700-plus-pound weight loss. 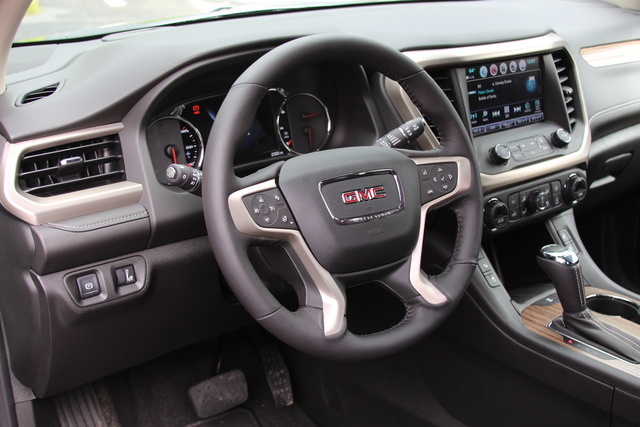 This is a smaller Acadia than you’re used to, and its numbers are impressive: 7.2 inches shorter in overall length, 3.5 inches narrower, and 6.6 inches shorter in height compared to 2016, and with a new 2.5-liter 4-cylinder engine, the Acadia can boast a nearly 750-pound weight loss. That’s an important number, as coupled with that new, more-efficient engine, the Acadia now lists mileage numbers at 21 mpg city, 26 highway, 23 combined. The 2016’s best effort was a comparatively greedy 15/22/18. More than that, these numbers mean a tighter, more nimble ride for the Acadia, a powerful advantage when consumers expect their crossovers to feel and drive like cars. The Acadia certainly doesn’t do that, but it doesn’t drive like an SUV of the late '90s either, especially with the optional adaptive suspension. Starting with the base SL trim, you can get into an Acadia for less than $30,000, and that doesn’t mean you’ll be dealing with a stripper, either. This trim gets you the new 2.5-liter engine with a 6-speed transmission and front-wheel drive (FWD), along with 17-inch alloys. Even here, there’s luxury to be found in tri-zone auto climate control, keyless ignition and entry, heated mirrors, a leather-wrapped tilt and telescoping steering wheel, 7-inch touchscreen with reversing camera, GM’s Intellilink infotainment system, and Apple CarPlay and Android Auto. You even get a 4G LTE Wi-Fi hotspot. If you’re not happy with FWD, you’ll have to move up to the SLE trim for the all-wheel-drive (AWD) option. 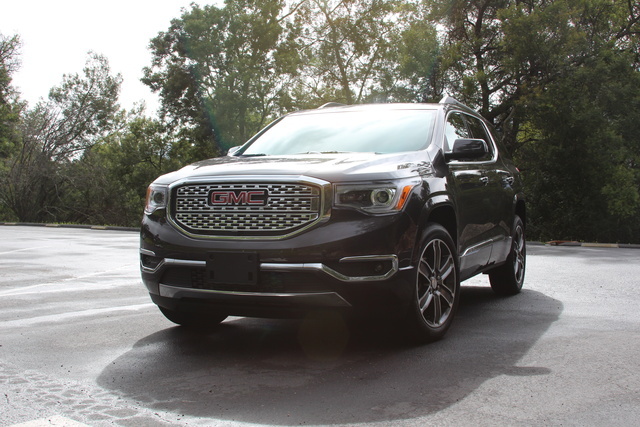 GMC splits its trims into 1 and 2 configurations, and in the SLE1, you’ll get LED running lights and satellite radio added to the SL trim’s list of features, boosting the price to $35,375. 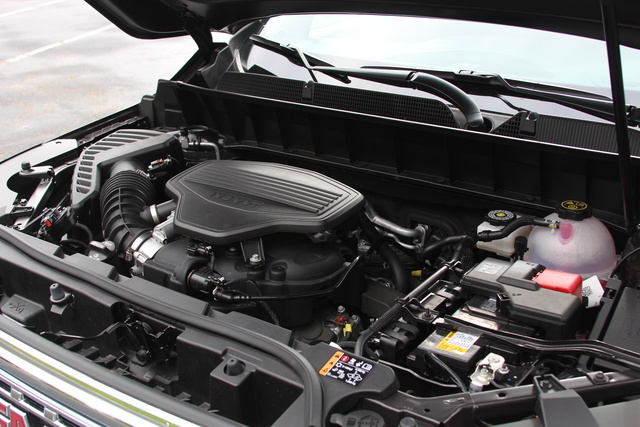 If you want V6 power from the Acadia, it’s the SLE2 that’ll deliver. In FWD configuration, you’ll pay $37,090 and get a substantial list of added features. Wheels increase to 18 inches, and front seats are heated with 8-way driver power, a power liftgate offers adjustable height options, and fog lights fill out the front grille. Tack on roof rails and remote ignition and you’ll see where that extra money went, but I think the biggest upgrade here is the standard second-row captain’s chairs that make third-row access much easier and keep kids separated on longer trips. 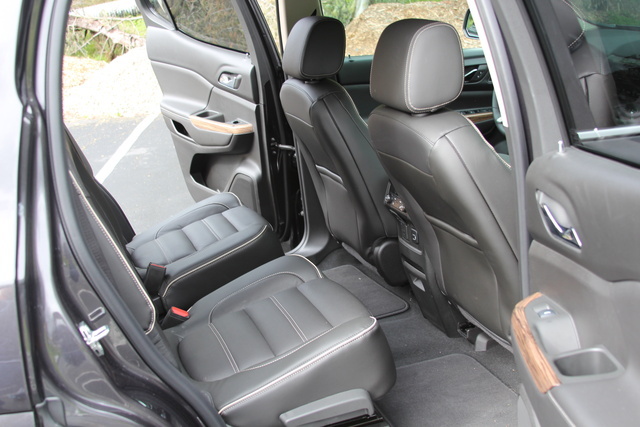 However, if you want full 7-passenger capacity, you can still opt for the second-row bench. If FWD won’t plow the field here, AWD will push the price to $39,090. With the SLT1 trim, the price starts at $39,275 for FWD and the 4-cylinder engine, but you’ll also add leather, an upgraded driver’s display, full power for the front seats with lumbar, auto-dimming mirrors, a Bose stereo, and the Driver Alert 1 package, which tacks on blind-spot monitoring, lane-departure warning, rear cross-traffic alert, and rear parking sensors. From here, AWD and V6 power are tied together, and that’ll push the price to $42,375. This is the last trim that can be had with the new 4-cylinder engine. The SLT2 really starts packing in the luxury features with 20-inch wheels, a trailering package, heated second-row seats, and the Driver Alert II package, which adds lane-keep assist, auto high beams, front parking sensors, and a low-speed forward-collision warning system with auto braking. If any of these systems are activated, a buzzer will additionally go off under the driver’s seat. For FWD, the SLT2 starts at $42,675, and AWD will add another $2,000. My week with the Acadia was spent in the top-tier Denali, which offers an upgraded 8-inch touchscreen with navigation and virtual gauge display for the driver, heated and ventilated front seats, a heated power steering wheel, xenon headlights, polished wheels, a unique grille, and a hands-free liftgate. Fitted with FWD, you can get in the Denali for $46,390, but with the optional Technology package ($1,345) which adds adaptive cruise with full-speed automatic braking and a surround-view camera system, plus the optional adaptive suspension ($1,200), Iridium Metallic paint ($395), and AWD ($2,000), the drive-away price including a $925 destination charge came to $52,225. Additional options include a 2-panel power sunroof for $1,400, your choice of two unique wheel designs for $1,795, a rear-seat entertainment system for $1,995, and wireless charging for $375. With a new engine and a substantial power increase for the V6, there’s a lot of good news here. The 2.5-liter 4-cylinder engine posts numbers of 193 hp and 188 lb-ft of torque, which would normally be a paltry showing for a midsize crossover, but with 2017’s weight loss, it’s more than enough to motivate. More impressive, fuel-economy numbers have increased to 21 mpg city, 26 highway, 23 combined in FWD configuration. As all Acadias previously came with a V6, that's a substantial improvement on the old “best” mileage of 15/22. Still, this isn’t a fast engine, and getting up to 60 mph will take more than 9 seconds. If that doesn’t sound too attractive, the 3.6-liter V6 now delivers 310 hp and 271 lb-ft of torque, an increase of nearly 20 hp and 5 lb-ft. And fuel economy is up here as well, with an AWD V6 Acadia being able to deliver 18 mpg city and 25 highway for a combined rating of 21. With a 6.3-second 0-60 time, that’s some useable power. Unfortunately, despite this being a full redesign, both engines are still mated to the old 6-speed automatic transmission rather than GM’s new 8-speed. This is frustrating, as the 6-speed is lurchy at low speeds and reluctant to shift during passing maneuvers. GM claims there simply aren’t enough 8-speed transmissions to go around. Still, with new transmissions coming out of GM nearly every year of late, I hope this 6-speed won’t last in the Acadia. The numbers here are shrinking. There’s truly no such thing as a free lunch, and with all the weight savings that come from the C1 platform, the sacrifice comes in the form of space and towing capacity. Whereas the 2016 Acadia boasted maximum towing of 5,200 pounds, that’s down to just 4,000 for 2017 and goes as low as 1,000 pounds in a FWD 4-cylinder version. Interior space took a similarly vicious hit, with 2016’s numbers of 24 cubic feet in the trunk and 116 total falling to 12.8 and 79 this year. The good news is that most of that drop fell on the third row and the trunk, and the first and second rows are still impressively spacious. At 6-foot, 4-inches tall, I had more than enough room in the driver’s seat with gobs of excess for my head and legs. I even fit in the second-row captain’s chair comfortably, and that’s a pleasant surprise. Visibility isn’t the best, as thick A pillars and a body “hump” below the C pillar obstruct sight, but the smaller, tighter chassis makes for a much more nimble Acadia that’s easy to park and squeeze through confined spaces. The optional adaptive suspension available on SLT2 and Denali trims seriously improves handling, especially at speed. The Sport setting here firms up the dampers and the steering to prevent floatiness while surprisingly not creating a harsh ride over bumps. It's a shame it’s not available on lower trims. The new All Terrain package is an interesting offering, adding trim treatments in black chrome, special 20-inch wheels, hill-descent control, and a more aggressive, twin-clutch AWD system, while deleting the third row for a cargo-management system. Really, this should come with smaller wheels, but I can see this being an attractive option for those living in snowier climes. 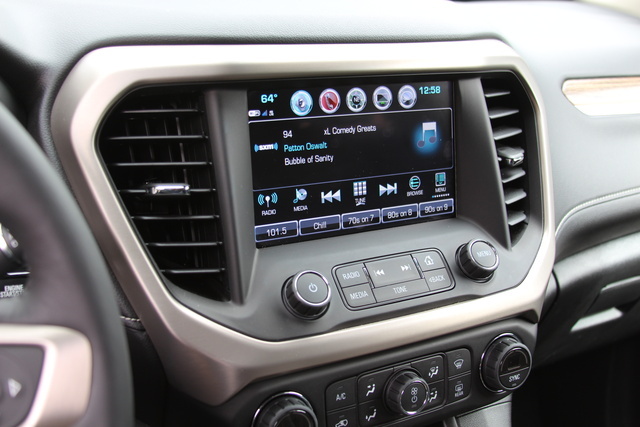 The standard Intellilink system, typically found in Buick offerings, is a functional, navigable system whether utilized in the base 7-inch or upgraded 8-inch touchscreen, and the upgraded driver’s display in the Denali is an attractive option. It’s the features in the base SL trim that really impress me, though. Tri-zone auto climate control, keyless ignition and entry, heated mirrors, a 4G Wi-Fi hotspot, and Android Auto/Apple CarPlay support in a vehicle for less than $30,000 is something to note. The real story here is in the safety systems, however. For an extra $10,000, the SLT1 trim will get you the Driver Alert 1 package’s blind-spot monitoring, lane-departure warning, rear cross-traffic alert, and rear parking sensors. The Driver Alert II package comes in the SLT2 and gets you lane-keep assist, auto high beams, front parking sensors, and a low-speed forward-collision warning and auto braking, but for the full suite you’ll need to go for the Denali and its optional Technology package with a surround-view camera and adaptive cruise with full-speed auto braking. I’m frustrated that safety like this isn’t available in lower trims, but that doesn’t discount the fact that this is an impressive batch of tech. 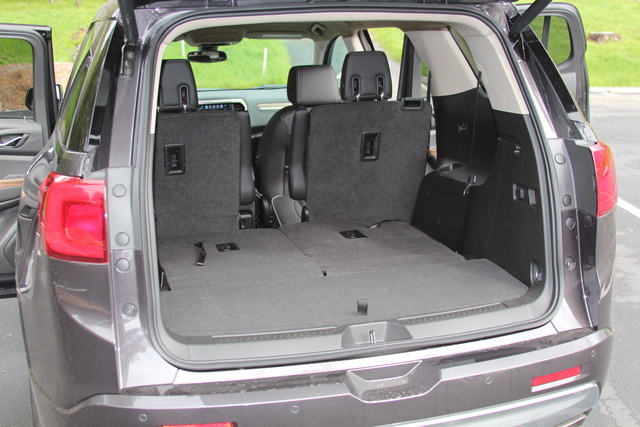 Beyond the safety systems listed above, the Acadia comes with standard 4-wheel antilock disk brakes, traction and stability control, and a full suite of airbags, including front, side, and full-length curtain bags, plus driver’s knee and inboard driver’s seat bags. You’ll also get GM’s Teen Driver technology, which allows you to set and monitor limits for younger drivers, with real-time reporting of violations of those limits. While the 2016 Acadia enjoyed 5-star safety ratings across the board from the National Highway Traffic Safety Administration, the 2017 redesign cannot boast the same. Frontal collision tests retain the 5-star rating, but all other tests have fallen to 4 stars. For $30,000, the Acadia offers a lot of tech and utility, as long as you’re not looking to tow or haul and can handle a 4-cylinder powerplant. $50,000+ for the Denali is harder to swallow, especially considering that cash will get you into a luxury midsize crossover, but it must be noted that any of those options would be base trims and not as well equipped. My preferred configuration here would be the SLE2 with FWD. If you can live with the 4-cylinder, you’ll save even more here and still have an impressively well-equipped vehicle for around $36,000 with a current $1,000 rebate from GMC. 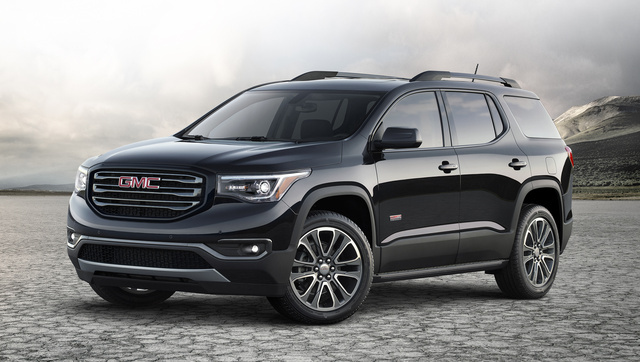 What's your take on the 2017 GMC Acadia? TheHorror It wants to be a truck so badly! GuruW448J Thanks to CarGurus, we were able to by 3 new vehicles that were siltly used we less that less than 25K miles! 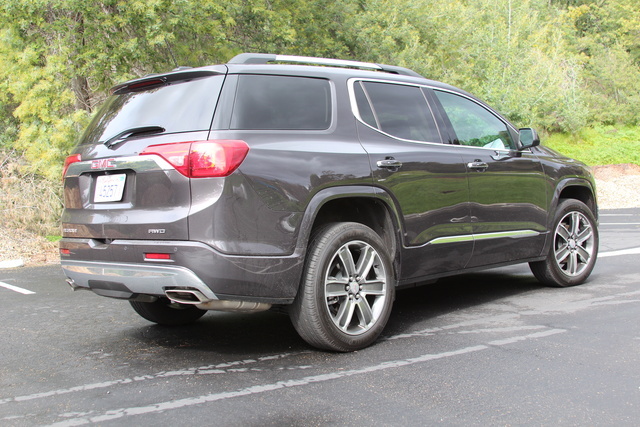 Have you driven a 2017 GMC Acadia? I have a 2017 gmc arcadia sle I want to change out my captain chairs that slide for a bench to sit 3 ppl. Is that possible? Is so, how? The controls on the right side of the steering wheel seem to only change things on the audio system. How do I get to the other parts of the DIC? I have a 2017 Acadia with just under 30,000 miles- the Master Cylinder went out. Is this a normal occurance for a new care?